On occasion, I have been known to chase significant, specific change in my life as the result what most people might generously refer to as “an odd tangent”. Less generous individuals might, however, suggest that sometimes I get a wild hair up my….well, you know. The point is, from time to time I get this weird notion in my head and decide to do something I’ve never done before. Then I go jumping off the deep end, all enflamed like a week-old spider bite and go running around, hell-bent on completing Exciting! New! Scheme! I’m worse than a lab rat pumped full of caffeine, skittering in an oval circuit from one end of his tiny rat-sized basketball court to the other as fast a his little pink feet will carry him. Meanwhile, my poor wife can do little but throw her hands up in the air and sigh in that tortured yet still somehow loving way that comes out as an long, slow expression of irritation, woe, and pity. The sad truth of the matter (although I’ll never admit it openly!) is that if I was to give the Puddinette and her Voice of Reason proper credit and attention before choosing to pinball across town on what is likely to result in little more a Fool’s Errand, well, I’d have more time to play video games in the long run. Of course, I make it a point of gentlemanly honor never to consider the Voice of Reason when I’m mid-flame up, because, well, where’s the fun in that? Of course, ignoring it does have drawbacks. 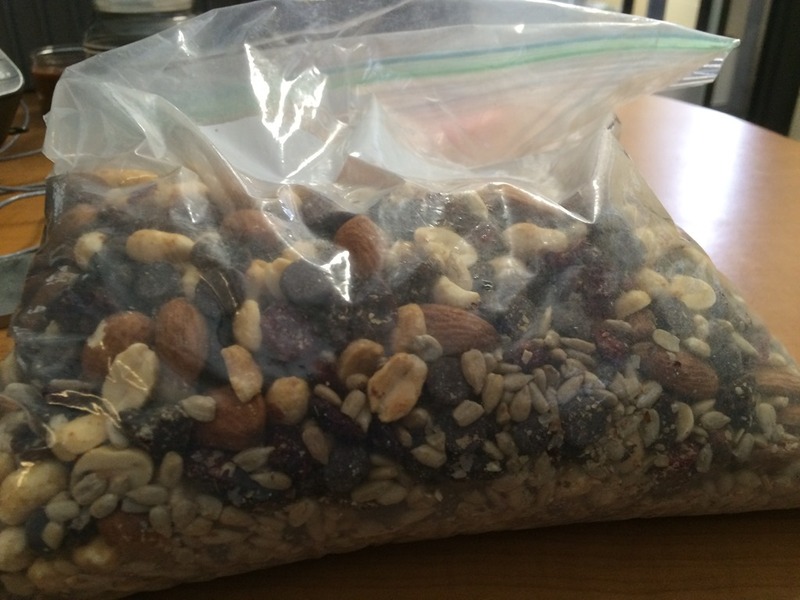 Pictured above – in case you didn’t recognize it – is a gallon-size Ziplock bag half full of Puddin’s Homemade Trail Mix. You want to talk about drawbacks? Look at the size of that thing! I’ve been snacking on it for months and it still looks very much like I’ll be holding the baby for pictures at my third grandkid’s baptism before I can eat it all. Plus, I now hate sunflower seasons with the kind of burning, irrational hatred usually only demonstrated by Evil Disney Stepmothers and internet trolls. But…I digress. Explaining Why I Hate Sunflower Seeds and Other Trail Mix Issues is, well, another post. This post, believe it or not, is about getting that wild, foolish hair in an unmentionable – and often itchy place – and deciding to act on it. Surely, you might think that as I stare at my nigh infinite supply of trail mix, I’d be tempted to give those uninhibited urges a wary eye in the future, right? Maybe even consider the Puddinette’s Voice of Reason for a second or two before launching into another great foolish endeavor? Because while reason is fairly often a phenomenal thing, when it comes to having silly, harmless adventures, it’s not so helpful. And if we can’t have a handful of ridiculous adventures from time to time – even ones as pedestrian as Making Our Own Trail Mix – well, then, are we really living our lives? Because that sounds a lot more like just trying not to make to much trouble while waiting to die. And that, for sure, isn’t something I’m prepared to do. So I’ll keep my gallon bag of trail mix and grin about it, even as I silently curse the sunflower seeds. I’ll giggle about that and the hundreds of other ideas that don’t, strictly speaking, makes sense, but make life better, nonetheless. So what is in this trail mix???? No lies….this is EXACTLY how I came to hate sunflower seeds. I still have a stockpile of them in my pantry. I’m keeping them in case the words ends and I’m desperate need and all the other food is gone.